Lok Sabha Elections 2019: Hinting at a tie-up with Congress, Arvind Kejriwal said his party - AAP - would do anything to "save the country" from PM Narendra Modi and BJP chief Amit Shah. Delhi goes to polls in the sixth phase of election on May 12. The results would be declared on May 23. Senior Congress leader Ahmed Patel said on Monday that it is up to the Aam Aadmi Party or AAP to decide whether it wants to forge an alliance with the Congress in the national capital. 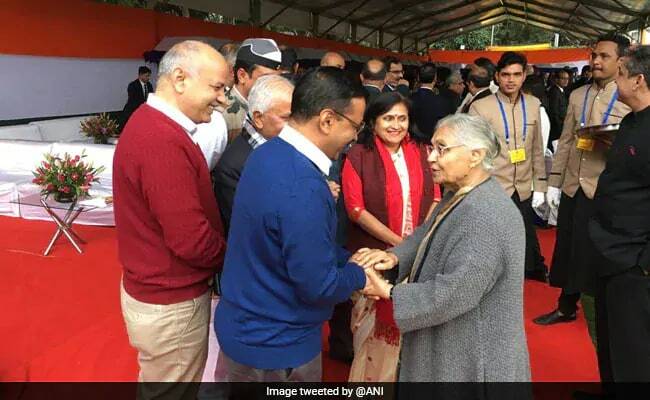 Sources have told news agency Press Trust of India that a fresh round of talks will be held between the Aam Aadmi Party and the Congress on Wednesday. During this meeting the Aam Aadmi Party is planning to propose an alliance with the Congress in Delhi, Haryana and Chandigarh with a seat sharing ratio of 5:2 in the national capital, the source said. Earlier too, the Aam Aadmi Party had suggested an alliance in multiple states and not just Delhi - something that the Congress had turned down. Congress's PC Chacko, in a press conference last week said that the dynamics in other states are different and should not be linked to an alliance in Delhi. Ahmed Patel had a similar response. "We have earlier said that our state units of Punjab and Haryana are not ready to forge an alliance (with AAP). In Delhi, Congress president convinced our Delhi unit that the alliance is important. They (AAP) were asking for four seats in Haryana. One for AAP while three for Dushyant Chautala ji''s party. In Punjab, they were asking for four seats, then later one seat," Mr Patel told reporters in Vadodara on Monday. He went on to say that "Congress president spoke with them but state units were not ready to forge alliance (with AAP), so there is no question about it. We are openly giving a 3-3 formula (for Delhi) and one seat for a common candidate. Then they said that they will take four. But they put a condition that they will forge an alliance only if the alliance takes place for Haryana as well. What is his intention to link Delhi with Haryana? I don't understand." Congress president Rahul Gandhi too tweeted about the possible alliance, saying that his party is still willing to give up four seats to the AAP to seal an alliance in the national capital and ensure the "rout" of the BJP. However, Mr Gandhi made it clear that a decision has to be made soon. Rahul Gandhi tweeted that "An alliance between the Congress and AAP in Delhi would mean the rout of the BJP. The Congress is willing to give up 4 Delhi seats to the AAP to ensure this. But, Mr Kejriwal has done yet another U turn! Our doors are still open, but the clock is running out." Ahmed Patel backed his party chief, saying: "Rahul ji rightly tweeted. There is no question on our intention, theirs might be questionable. We are ready for alliance in Delhi. We are optimistic. Our proposition still stands, the ball is in their court." In a prompt response, Delhi Chief Minister and AAP chief Arvind Kejriwal tweeted in Hindi, saying "What U-turn are you talking about?" "I am sorry that your tweet gives the impression that the alliance is just a show. Unfortunately, you are helping (Narendra) Modi to share the anti-Modi vote in UP and other states too," Mr Kejriwal charged back on Twitter. Wednesday's possible meeting between the Congress and AAP is being mediated by NCP leader Sharad Pawar. Congress's Ahmed Patel would hold talks with AAP's Sanjay Singh, sources said, according the news agency PTI. This would be the second meeting held in Sharad Pawar's presence over talks of an alliance in Delhi. On Sunday, Arvind Kejriwal said his party would do anything to "save the country" from Prime Minister Narendra Modi and BJP chief Amit Shah. Delhi goes to polls in the sixth phase of election on May 12. The results would be declared on May 23.